website security, and ecommerce platforms. 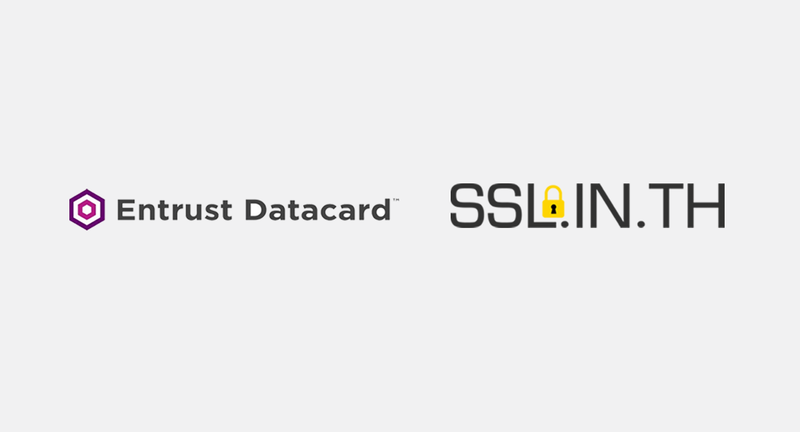 Bangkok, THAILAND - (February, 2018) - Entrust Datacard, a leading provider of trusted identity and secure transaction technology solutions, today announced it partnered with SSL.IN.TH, an exclusive distributor of multi-brand SSL Certificates under Netway Communication Co., Ltd., for SSL/TLS and Digital Signature business. The partnership comes with a distributorship of the certificates via automated local billing platform and management portal operated by Netway Communication team. For Netway, Entrust Datacard partnership adds more portfolios into its ranges resolved on the website SSL.IN.TH, expected to cover double digit market shares in enterprise IT and SMEs in Thailand. For more than 7 years in SSL Certificates (aka SSL/TLS), SSL.IN.TH has been serving website security business in both SMEs and enterprises, covering all segments who want to have their own secure ecommerce platforms. It started with such common brands as Thawte, RapidSSL, GeoTrust, Digicert, GoDaddy, and Comodo, followed by the rapid growth of ecommerce websites and mobile apps in Thailand. Until now, the SSL customers are growing and seeking more and more options on their website security. That was why is partnership becomes active today. In terms of Financial Services Industry (FSI), most commercial banks and public institutes rely on SSL.IN.TH to provide website security solutions for their online banking and mobile banking apps. Some, however, are using Entrust Datacard and some other brands with direct purchase and support. With this channel, the challenges of installation, validation, maintenance, and renewal with regional operation center may be caused by time zone and language barriers. So, this partnership becomes a ceremony when SSL customers can enjoy such services from locally-enabled professional teams under SSL.IN.TH. As for other enterprise-scale corporates, this partnership enables them to explore more value-added SSL brands such as extensive and comprehensive website security, malware and phishing protection, and reliability of the certificates, all of which are regulated by world-renowned CA like Entrust Datacard. All in all, this partnership becomes active since 2018 and SSL.IN.TH team can provide price lists and product portfolios to all resellers and end-users in Thailand and also its neighboring countries. With product know-how transfer, the SSL.IN.TH team is now an implementer on most global brands of SSL Certificates.